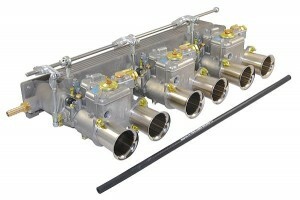 Webcon is delighted to announce the launch of their new Weber 45DCOE kit for the 3.8- and 4.2-litre Jaguar XK engines. Part number PJA301 uses a new, top quality UK-designed and manufactured inlet manifold in addition to Webcon’s own stainless steel rod-linkage system and three genuine Spanish-made, Weber carburettors. All soft mounts, studs and nuts are included in the kit, as is a Weber tuning manual for those customers who would like to learn a little more about tuning their carbs. PJA301 is priced at £1620 inc VAT and is available in stock for immediate shipping, available directly from Webcon and from their officially-appointed dealers around the world. More from 01932 787 100 or www.webcon.co.uk ENDS. Print article This entry was posted by admin on February 21, 2013 at 5:36 pm, and is filed under News. Follow any responses to this post through RSS 2.0. Both comments and pings are currently closed.